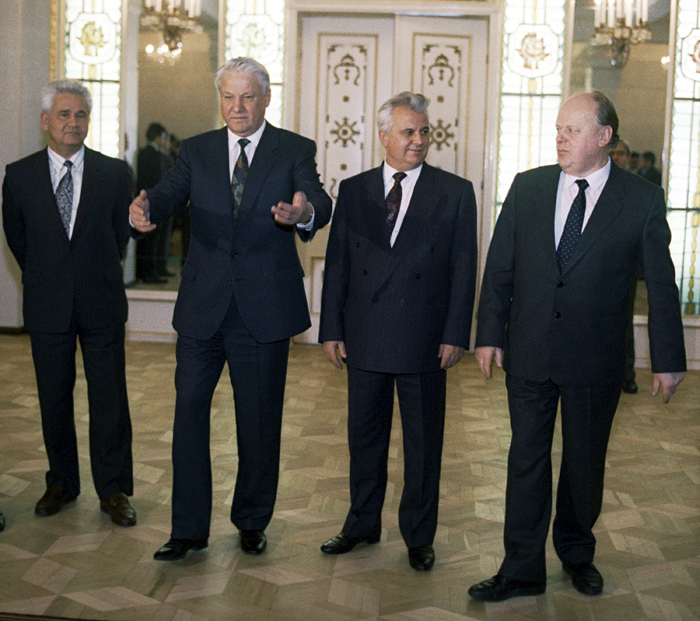 Russian President Boris Yeltsin (second left), Ukrainian President Leonid Kravchuk (second right) and Chairman of the Belorus Supreme Council Stanislav Shushkevich (right) in Belovezhskaya Pushcha at the signing of the Agreement establishing the CIS (Commonwealth of Independent States). The image of the “ideal” Russia, which prevailed among the elite of the former Soviet republics for the last 25 years, came into conflict with the “real” Russia in 2016. Dmitry Yevstafiev says the republics need to quickly decide if they want greater economic and political integration with Russia. Over the last few months Russia and the former Soviet republics have witnessed some events that were perceived by many as a manifestation of a crisis. These include the arrests of ‘pro-Russian’ journalists in Belarus, Kazakhstan President Nursultan Nazarbayev’s publicly stated grievances on the fate of Kazakh natural resources during the time of the Russian Empire, and statements from Kyrgyz President Almazbek Atambayev calling for the future closure of a Russian military base in the country. Behind these statements lie not only emotions, but also systemic changes in Russia's role in the post-Soviet space. Russia’s relationship with former Soviet republics (or more specifically with the elite of post-Soviet states) peaked in the late 1990s and the early 2000s. This is period when Russia solved its deep statehood crisis and showed its first signs of economic growth. The way the elite of the former Soviet republics saw it, an “ideal” Russia was a country that was politically weak and dependent on the West. It neither posed any threat nor put any pressure on the former Soviet republics, but needed to be strong enough to be a source of economic dividends. Today's reality is somewhat different from this image. First of all, the Russian political system demonstrates signs of stability, and is backed by a national consensus in foreign policy, including on relations with the Commonwealth of Independent (CIS) countries. Secondly, there is only one country, which displays a specific interest in dealing with former Soviet republics on its own - China. Key Western countries consider the post-Soviet space, mainly in the context of relations with Russia. Thirdly, due to the devaluation of the ruble in 2015-16, Russia was able to start expanding exports to Eurasia, ensuring that trade flows two ways. Fourth, 2015-16 has also led to an early recovery of the industrial potential of the Russian economy. Russia is building new production facilities in its territory and is able to re-establish certain industries from scratch, for example in the field of advanced chemical and petrochemical industries. Finally, Russia remains the only real guarantor of the security and integrity of post-Soviet states. Moscow is not questioning the very existence of any country of the former Soviet Union. This even applies to those cases where the United States openly describes republics as failed states. Russia’s role in the former Soviet states is changing with the very changes in the Russian political system. This in turn would put an end to the pseudo integration processes in the post-Soviet space. In this regard, the question arises about how countries of the former USSR will have to interact with Russia in the next few years. In today's global economic situation the former Soviet republics have only two options. They can either seriously dive into the economic integration processes in Eurasia, which inevitably will be linked to a rising economic growth in Russia. Or they can try to fit into the mechanisms of economic growth in neighboring regions. This would primarily be China and, to a lesser extent, Iran and the countries of the south. If in the first case the republics can still stick to mainly economics, the second choice will demand the elite take substantial political risks, for which they are not ready. Who really needs the Eurasian Economic Union? Finding of a new format of interaction with a new, stronger Russia is the safest option. Meanwhile, Moscow has clearly been leaning towards a more pragmatic approach towards economic relations with its former satellites and is shifting from multilateral formats of economic integration to bilateral. In this regard, the republics of the former USSR, and not Russia, should be interested in preserving the multilateral integration processes. However, for this they will have to forget the image of a “weak Russia” and cease to perceive the Eurasian Economic Union as just an extended free trade area. Only in this case will the former Soviet republics be able to engage in the process of economic growth, which is emerging in Russia. However, the “window of opportunity” is closing, so the republics should make their proposals to Moscow in the coming year. This is an edited and abridged version of an article, first published in Russian by eurasia.expert.